Reviews and giveaways coming soon for these books! For no particular reason, I got all excited about bright festival colors last week. So I pulled out my brightest most silly beads, mostly acrylics, and stitched up this silly silly button for my Bead Journal Project piece for August. 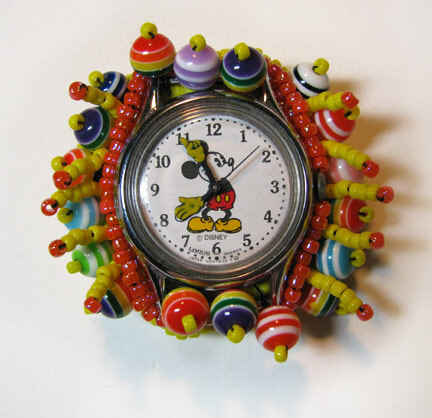 Of course Mickey had to be the centerpiece of this particular watch-face button! Jean points out a lovely book which is a bestseller which she has a project in: Best of BeadStyle, Vol. 7 ! Please come and see how pretty it is! What does it mean to really be ready - to sell online, to succeed... Charlene shares some thoughts and talks about where she is with this journey. Returning from Philadelphia, Andrew gives a recap of BeadFest! 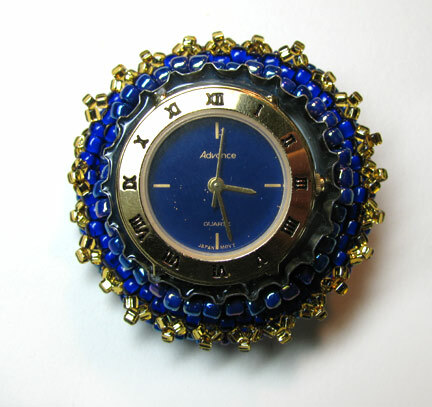 Do you have a favorite project that you turn to for using leftover beads? Stop by A Bead A Day to share an idea or pick up an idea! Craft stores have come a long way with the jewelry supplies they now offer. Take this quick poll about your own craft store experience. ABS Editor, Jennifer shares how to create a look for a store/gallery. Michelle uses the story of Cinderella to inspire a pair of earrings and shares a related upcoming challenge at Stringing magazine. This week will be "etched" into Carmi's summer memories as she blogs for John Bead. Cindy reviews Steel Wire Jewelry. There is a new series this week featuring EasyCast clear casting epoxy. Wendy Chamberlain, who writes Bears, Beads, and Beautiful Things, is the winner of Margot Potter's exciting new book. Congratulations Wendy!! With retirement in the fall 1999, I started a new day job of creating art using fabric, paints and beads. I’ve been very fortunate to be able to take classes from some of the best fiber artists. Their influence and direction have given me the ability to create my own art by designing, embellishing, dyeing and painting fabric. 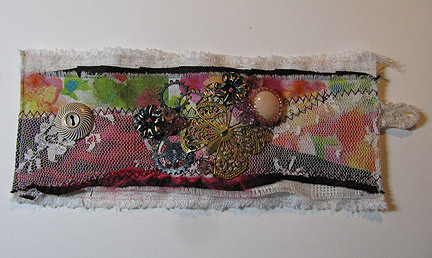 I love to add texture and dimension to my work, often by adding different fibers, bead embroidery and hand stitching. I also stay off the golf course by doing my art work, which makes my hubby very happy! Volume 6 in the Kalmbach series, Creative Beading , is available...and you'll have a chance to win a free copy here! 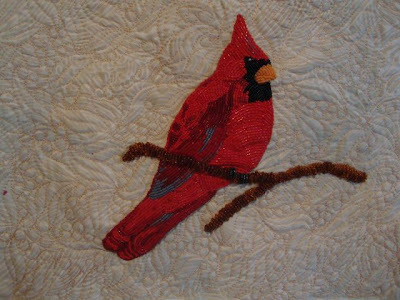 All the projects included are the editor-tested stitching and beading projects from the past year of Bead &Button magazine. And there are 77 (that's SEVENTY SEVEN) different projects, some with several variations: stitching, stringing, embroidery, crochet, and wirework. If you don't subscribe to Bead&amp;amp;Button, you definitely need this book! And now you have a chance to win this book! Just leave me a comment below and you'll automatically be entered to win. If you tweet or post on Facebook or other social spots about the contest, you can leave a second comment and be entered twice! Please make sure that your link will lead me to an email address, or else I won't be able to contact you. No contact, no win, and I simply have to go on to the next person. Deadline: August 30, 2011. 1. 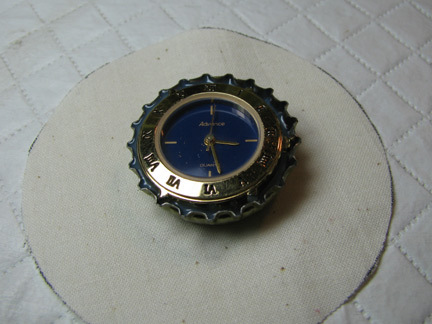 Use a nail or small drill to add two small holes to the bottom of a bottle cap or another bezel that will fit the watch face. 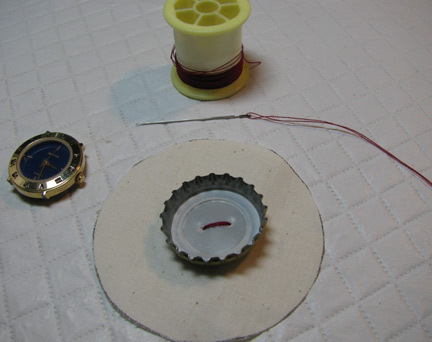 Stitch the cap to the fabric that has been cut out to form the covered button. 2. This shot shows you the back side of the button fabric, including the fused interfacing that I add to keep the button fabric from sagging. 3. Add two-part epoxy resin to glue in the watch face. Let it dry thoroughly before you start beading around it. 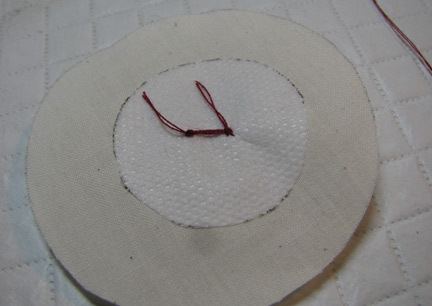 Here's a link to the tutorial which shows you how to turn this little piece of reinforced fabric into a covered button! 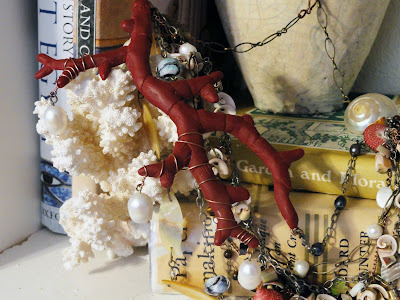 I love Red coral, but to be environmentally conscious I decided to make my own branch from polymer clay. I created the main focal by smoothed out coils of red clay wrapped around a wire armature. Pretty cultured pearls dangle from the limbs and are linked on chains. Also, a veritable cacophony of vintage and new beads hang on multiple chains including: mother of pearl, abalone, hand blown glass, and polymer clay. Pretty shells that are drilled with my trusty dremmel are hung with chain fringe. And the connector is a lovely pearly shell that I drilled to hang a large wire loop inside to connect everything together (to stabilize the loop I stuffed the shell with a mixture of soft paper fiber and glue). 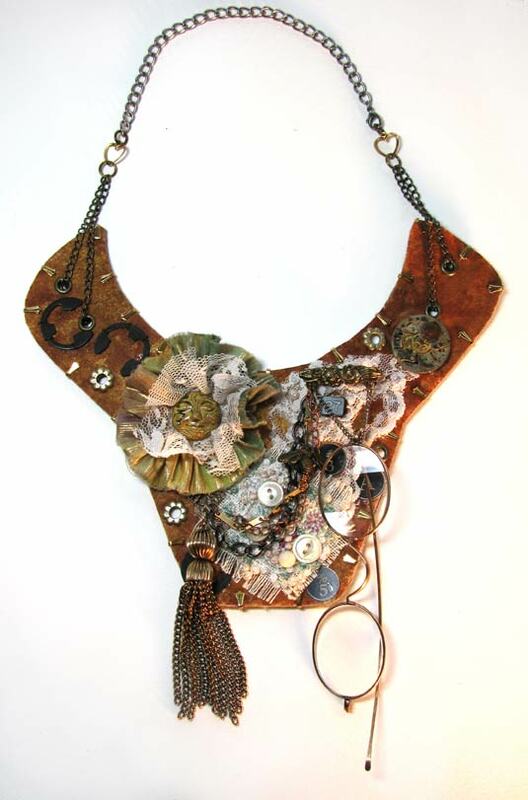 I used antique silver, gold, and copper chains in different patterns to further add character. I'm happy with this piece and look forward to test driving it (wear it out). I created a cab with transparent polymer clay. Transparent clay was used because I wanted an internal glow to the surface; this compliments oil paints so well. The clay was beveled into an oval shape and sanded so there would be a smooth surface to paint on. It was not buffed, as it needs some tooth. I painted in thin transparent layers or oil thinned with a liquid mixture or resin and turpentine called liquin. The cab is baked for 45 min on the lowest setting of 170 for each layer / in total 5 layers, this speeds the drying time. In between the time the cab was baking I worked on the cane for the lilies. Gold/white and transparent clays where used to make this cane. I cut out the petals and shaped them into two lilies, and a few buds. I wrapped a silver toned metal chocker in copper. Black iridescent freshwater pearls are gradated and wired to the inside. 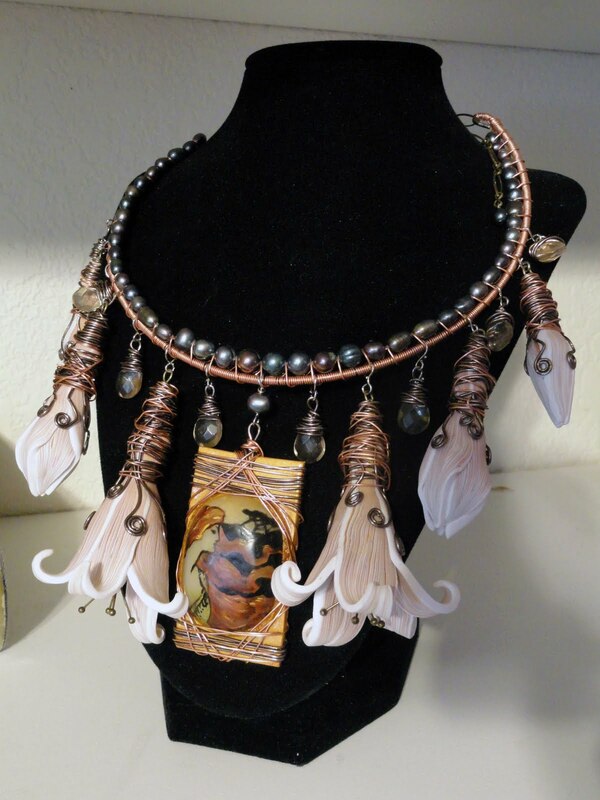 The looping copper wire to attach the pearls make great resting points to hold my hanging beads in place. 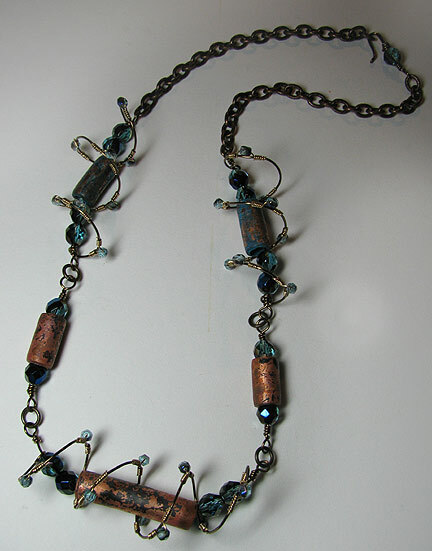 I'm pleased with this art inspired necklace and feel more comfortable using wire in my projects. Carmi uses a great new mold to make "people" donuts. 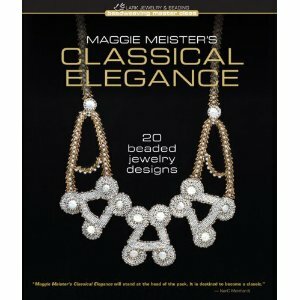 How to win the great giveaway of Maggie Meister's Classical Elagance--an amazing and breathtaking book! See jean's blog! 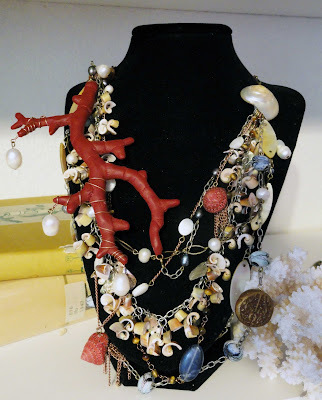 Charlene shares her dreamy mermaid necklace and links to other participants in her first ever jewelry challenge. Set up your jewelry designing by making the perfect jewelry sets. 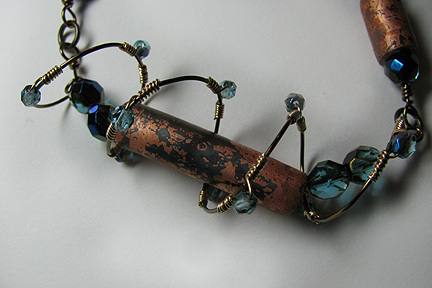 Try something different with your art beads - ribbon! Margot Potter's new book inspired Carmi's new linked necklace. Need some iron in your jewelry diet? Tuesday Tangle has just what you're looking for! Located in Nice, Provence-Alpes-Cote D'Azure, France, Mouna Marini designs mostly a one of a kind embroidered jewelry pieces. From simple, everyday pieces to bridal jewelry and special occasions pieces, each item has its own story and inspiration from history , art deco or art painting. 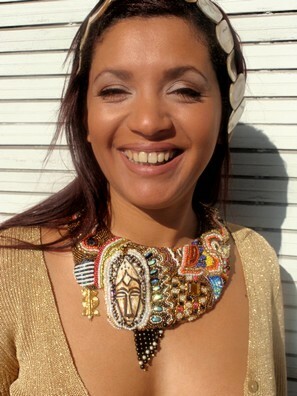 Mouna enjoys using high quality materials in her designs, creating both chic elegant and Bohemian style pieces. 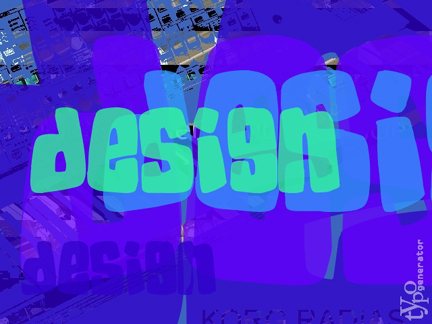 Mouna writes, "I have loved to design since I was a small child. 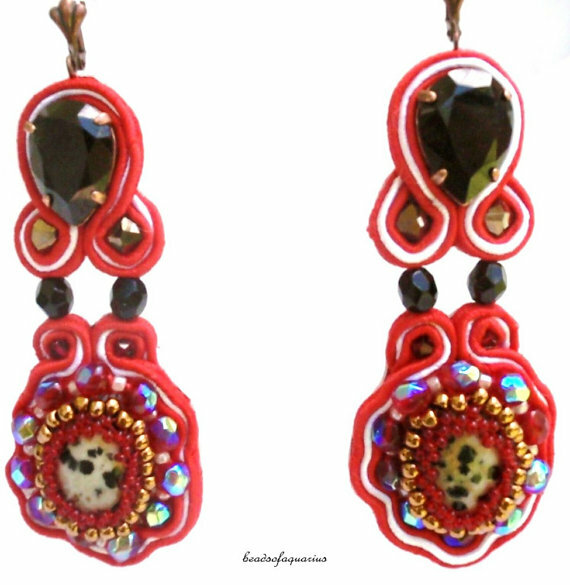 After 10 years in the world of fashion, I started designing embroidered jewelry and it become my passion! I love working with several colors and materials in one unique piece." 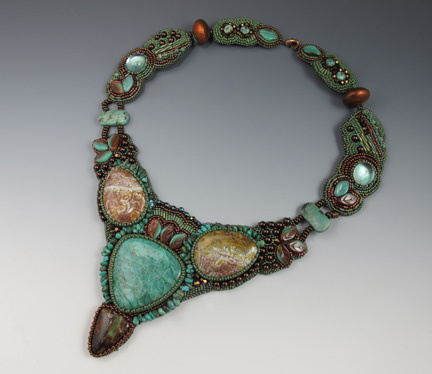 Margot Potter looks at wire not only as a structural element in jewelry design, but also as decorative. She has done what no one, to my knowledge, has done in a book before, combining stiff sculptural wire with flexible beading wire in the same designs. 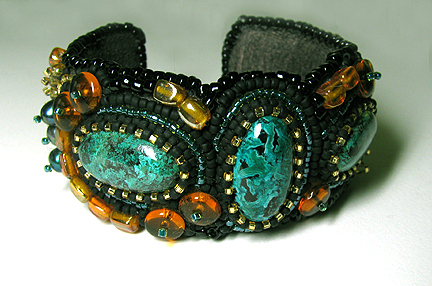 New Dimensions in Bead and Wire Jewelry is the results of Margot's explorations. If you're tired of wire designs that all look the same, this book is for you. If you would like to learn about how to use all different types of wire, not just high-priced silver and gold, this book is for you. If you enjoy being given instructions that include the advice to color outside the lines and take some risks, this book is definitely for you! The earlier projects are fairly fast and easy, becoming trickier and a bit more time-consuming as you make your way through the book. I made a version of one of Margot's projects that she calls Helix, and it took me about 3 hours, not counting time to make the copper tube beads. And now you have a chance to win Margot's new book! Just leave me a comment below and you'll automatically be entered to win. If you tweet or post on Facebook or other social spots about the contest, you can leave a second comment and be entered twice! Please make sure that your link will lead me to an email address, or else I won't be able to contact you. No contact, no win, and I simply have to go on to the next person. Deadline: August 24, 2011. 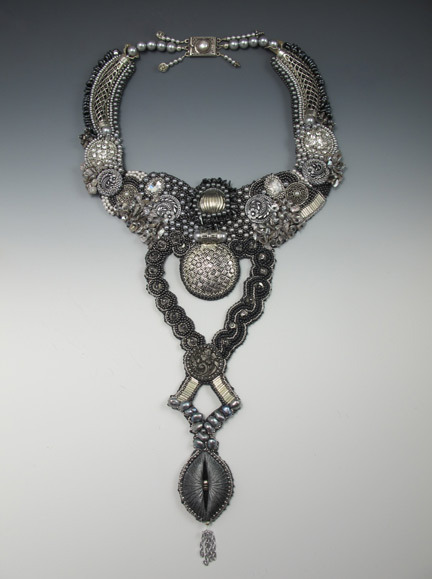 It's worthwhile to check out the archives of your favorite beading sources every so often! 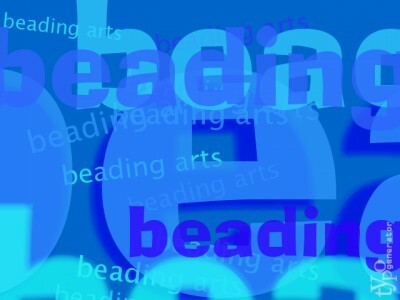 Two older posts on Beading Daily caught my eye. The first was written by Marlene Blessing. Marlene got to see a LOT of jewelry, both for Beadwork and for Stringing magazines, so when she has something to say about making jewelry that people will love, it's a good idea to listen. At first, Marlene's post sounds like a lesson in design composition: balance and color are key to catching the eye. But then she dives into a couple of topics that will get you noticed by the magazines that you might want to submit to: originality, simplicity, and photography! Whether or not you want to see your work in a magazine, these tips are worth reading through. I told you awhile ago about my friend Michelle Mach's "Mostly Metal Challenge." Well, today is the much-anticipated reveal day, at least much anticipated for all of us who are doing the challenge, because Michelle, the sneaky pants, didn't even tell us who else was playing! So the whole reveal is a huge surprise for all of us. Anyway, I decided to use the pieces to make a fabric cuff in a style that is a bit different from my usual. 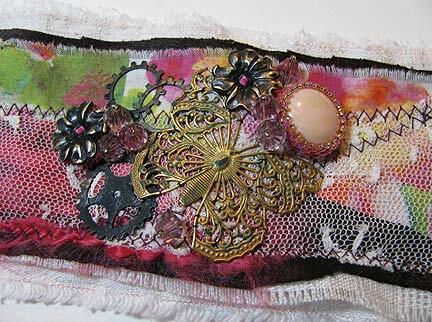 I've got some photos on Mixed Media Artist that show how my version goes together, but your best bet is to get the July/August 2011 issue of Cloth Paper Scissors and read Teresa Stanton's brilliant article called "Wearable Art Cuff." Here is a list of all the participants in the Mostly Metal Challenge...I plan to visit them all! People without a blog will have something posted on Michelle's blog that day. If making a full-sized bead embroidery necklace seems too daunting, maybe you could think about making a bracelet instead. If you start with a plain metal cuff, you'll find that it works up much more quickly. 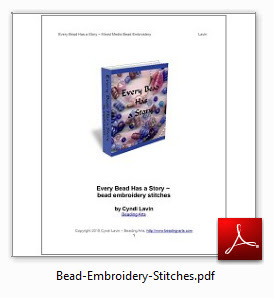 Follow most of the directions, including the instructions for the different stitches that you'll find in the free chapter of Every Bead Has a Story. 1. Trace the outline of the cuff onto a backing fabric like ultrasuede, but don't cut it out yet. Glue down your cabochons and begin your bead embroidery. 2. Prepare the metal cuff. You'll see in the photo above that I used to wrap the cuff in fabric and stitch it in place across the top, which will later be covered by the beadwork. I don't do it this way anymore. 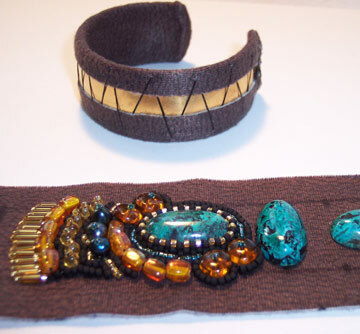 I find it is more versatile to simply glue a large piece of fabric to the back of the cuff and then cut the edges even with the edges of the beadwork. You can do it either way that appeals to you...try both! 3. When your bead embroidery is finished, cut out your piece carefully, leaving a very small strip of fabric around the edge. 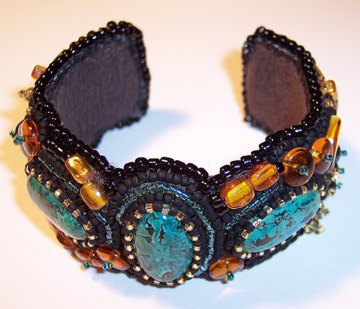 Glue the beadwork to the top of the cuff and add an edging stitch (either edging brick stitch or edging back stitch) around the piece to finish it off. Cindy's got a new tool on her workbench, a rolling mill. 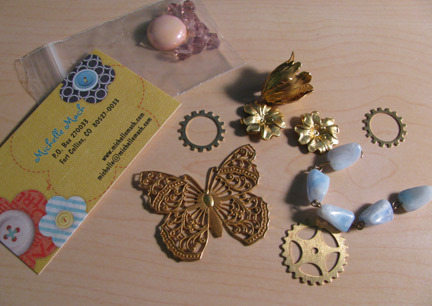 Check out the jewelry pieces that have rolled out onto her bench! Jean is getting verrrry excited, anticipating Michelle Mach's Mostly Metal Challenge! Come read about it! In an effort to help launch Allegory Gallery, Andrew announces the Allegory Gallery Fundraiser! Make a donation and receive a prize for your support! Get twisting with your beads and learn to make a very cool twisted strand necklace with this bead weaving technique. Come check out the August challenge! 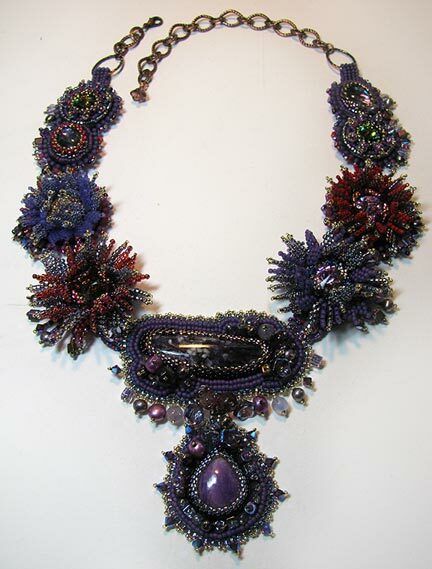 I admired the work of Sherry Serafini for years and she was in Atlanta teaching classes at a local bead store a few years ago. I have now taken three classes with her and another one next week is scheduled. Bead embroidery is addicting, once I started I could not stop! 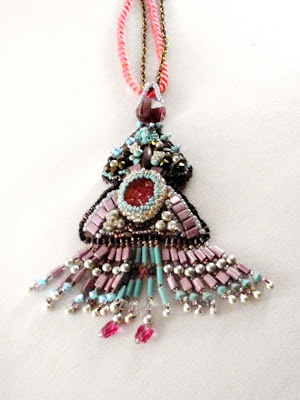 I love hand-work anyway and this combines my love of beading and sewing. To me, it is calming. I am not a "patient" person normally, but somehow I am so patient with this work-intensive, time-consuming craft - I think because it turns out so gorgeous. I never "plan" a pattern, just wing-it so never know what may come out. That is exciting to me too. I love to wear one of my pieces and have someone admire it, then I tell them I made it and they always say "YOU MADE THAT?" which is so amusing to me! 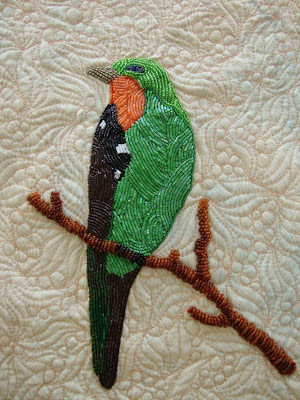 As you know, the bead embroidery technique is not difficult, it is basically a backstitch with peyote around bezels and edging. But people are amazed when they see how MANY beads are sewn into a piece. 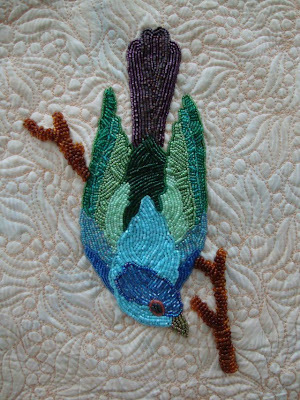 I have sent professional photographs to Lark Books which has a call for bead embroidery artists to be in a new "500" book next fall. That would sure be a thrill to be in print!